Or make-up, or make-over, or whatever. Take a look at this pic. I think she needed them all. Gloria Swanson really gave it her all to play fading (in fact she had totally faded) film star Nora Desmond in that great cinematic classic Sunset Boulevard. One of the lines I loved was "I am big, It's the pictures that got small." Her character was kinda creepy. And I think she would have benefited from a make-over. What about this blog? You think it could use a make-over? The folks over at Tribal Blogs are holding a blog make-over contest. Meh, I thought when I first heard of it. What did Old McDonald say? You know, the guy with a farm? 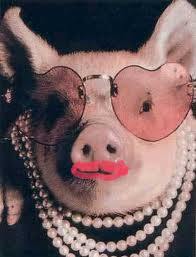 Oh, yeah: "You can put lipstick on a pig, but it's still a pig. And if he goes wee wee wee all the way home he should have gone before he left." But as I got to thinking about it I thought to myself "Hey, everybody loves bacon. What have I got to lose?" I also got a little confused between the terms "make-up" and "make-over". I've never worn make-up but I thought, hey, for $300 worth of goodies I might go so far as to get a brazil wax. I mean for heaven's sake, take a look around this blog. The layout is...well...blahhhh. Yeah, sure, it's clean and uncluttered - which is good - but, hell, it reeks of antiseptic...or antidepressants, or antioxidants, or antiperspirants - well which is what you need if it reeks, right? You can gaze upon the $300 prize package here. Among the prizes are custom graphics which include something called a favicon. Gee, I didn't know Milli Vanilli had reunited. An installation of five key plug-ins is included. That would come in really handy 'cause I'm redoing my kitchen and the more plug-ins the better. And they're offering something called a premium SEO submission. I don't know what that means but I kinda like Lionel Richie. You know, he sang "Say You, Say Me, SEO" Isn't that how it went? So wish me luck. This blog may soon be wearing lipstick. Dang! How am I supposed to compete for the Tribal Blogs makeover now? I guess I'll just have to settle for stealing the pig pic for my new avatar. Are you going for a new sty-le too? HA! I'm proud of you Nomesters! You resisted a dig at Sarah Palin. Yep, you did. Soooooo-weeeee! Good luck! And I hope you win! Hey, accidents will happen. I hope you found enough of interest that convince you to come back. Where else you gonna see lipstick on a pig? Yeah that was the last time that expression got traction. But who wants a blog that looks like Sarah Palin? I hope I win, Quirks! This is the real thing . It's no pig in a poke. I'm looking for a new sty'le to complement the sty'le of my home. Up your nose with a garden hose, baby. Alas, I am quite busy assisting guarding our Alaskan border from the Russians. Crisp, Clean, no Caffeine. An uncluttered funny site to read. Sorry, hope you don't win, probably wouldn't want to visit anymore. Thank you Sarah I see you're so busy you forget to apply your lipstick today. Aw, that's very nice of you. Thanks. Wait! Jen sent you didn't she? She wanted to let me down easy, I know. this blog would look FANTASTIC in the right shade of Lipstick! I was thinking of something in a mauve sparkly, gloss kind of thing. What do you think? Wait! You mean you've been dating my ex-wife Jen? Now I kind of hope you do win. Your ex-wife is Jen at Tribal Blogs? What a small world. Up your gizzard with a rubber lizard, baby! In your ear with a can of beer, dear. Wait a minute. That'd be a colossal waste of beer. Um, on your shoulder with a can opener? Just doesn't have the same impact, does it. Winner! Winner! Chicken Dinner! This post is so good it's almost a shooo in. But now we need to see what that gorgeous, glamorous, and giddy Cheese Crew does! Linda, you don't need to see the "Empress in her head's" submission again. Like the Titanic she's going down. And thanks for the vote of confidence. Whatever you do, DO NOT, I REPEAT... DO NOT GET THE BRAZILIAN, I admit it might make Little Dufus look a little less, well, um little, but that is a pain compared to no other. Spare yourself first. Great post. But I'm still torn between voting for you and the chick in the pink sundress with the phone card and the baby oil. It's not personal. When do you find out if you are the winner? Also, thanks, because I just signed up for a makeover with Tribal Blogs. (I told them I found them via you, so maybe you'll get a finder's fee. Or a widget. Can't have too many of those. Hey, that's cool KABLOOEY. I wouldn't turn down a finder's fee. As long as it's not a box of lipstick.